Ring magazine number 10 ranked bantamweight Jason “The Smooth One” Moloney 17-0 (14) moved one step closer to a wildcard entry into the new season of the World Boxing Super Series (WBSS) with a sixth round TKO of former two-time world champion Kohei Kono 33-12-1 (14) of Japan at the Malvern Town Hall in Melbourne, Australia on Saturday night. The bout was stopped between the sixth and seventh rounds after the ringside physician determined that a cut to the outside of Kono’s left eye was too severe to continue. Moloney became just the second boxer after Japanese phenom Naoya “The Monster” Inoue to stop Kono in his 46 fight pro career. Moloney’s team have been pushing for a spot in the eight-man, single-elimination WBSS tournament that will feature WBO champion Zolani Tete of South Africa, newly-minted IBF titleholder Emmanuel Rodriguez or Puerto Rico and Belfast’s WBA “super” champion Ryan Burnett. If two-division world champion Inoue gets past WBA “regular” champion Jamie McDonnell of the United Kingdom when the two meet at the Ota-City General Gymnasium in Tokyo, Japan this Friday night, he will be granted entry to the WBSS tourney as well. “I believe I’m the best bantamweight in the world and these are the types of fights I need to prove it,” said the Melbourne-born Moloney, who is ranked WBA #4, WBO #5, IBF #11 and WBC #13, after the fight. The fight was Moloney’s third successful WBA Oceania title defence since moving down in weight to bantamweight. 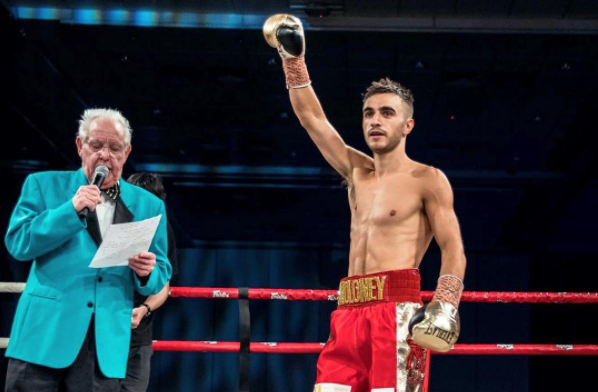 On the same card Jason’s twin brother Andrew Moloney 17-0 (10) survived a scare in the seventh round to successfully defend his WBA Oceania super flyweight title against rugged Filipino Richard Claveras 18-4-2 (15) in a 10 round bout. The aggressive Moloney was dominating Claveras until a counter right cross during an exchange on the ropes in the seventh round caught the hometown fighter on the chin and sent him to the canvas. Moloney comfortably beat the count and boxed more cautiously after that to win a wide points decision by scores of 99-91 and 98-91 twice. The WBA #5, WBC #5, IBF #5 and WBO #10 super flyweight is targeting WBA 115-pound champion Khalid Yafai 23-0 (14) of the United Kingdom. Meanwhile in Queensland, Australian junior welterweight champion Liam “The Prodigy” Paro 14-0 (10) needed less than two rounds to claim the WBO Youth title with a dominant performance against the Czech Republic’s Sebastian Bytyqi 11-1-1 (8) at Southport Sharks Club on the Gold Coast. The 22-year-old southpaw, who is a regular sparring partner of WBO welterweight champion Jeff Horn, had Bytyqi on the canvas twice before the referee halted the contest and crowned Paro the new WBO Youth champion. The time of the stoppage was 2:01 of round number two. “I know if I do hit someone clean, they’re not going to get up,” said Paro after the fight. Next up for Paro will be a fight against former national and regional champion Valentine Borg 14-2 (8) in Melbourne in July.